The development of techniques brought comfort and convenience to the human life. You may find evidences all around you. For travelers, development of public transportation would be the best thing for them. If you plan or live in Korea, take this advantage as possible as you can. KTX connects all regions in Korea within 2 or 3 hours today. I and my Dutch friend took that advantage in sunshine day. We took one day trip to Gyeongju city, a millennium capital city of Silla Kingdom(57 BC – AD 935) in Gyeongsangbukdo province. Silla kingdom is one of the few kingdoms in world history which lasted for more than one thousand years. Silla was transformed from the weakest power of the Korean Peninsula to a powerful prospering kingdom which at last would unite the peninsula. A thousand years of Silla’s system have continued to greatly inspire and challenge modern Koreans. 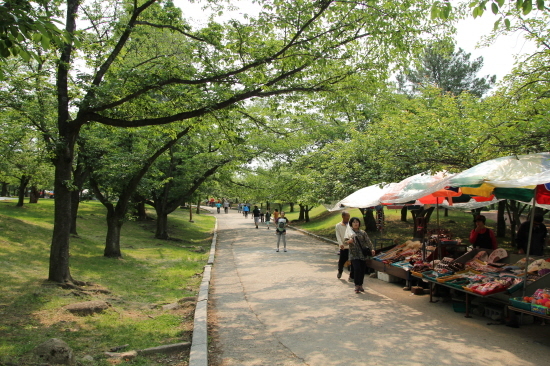 Due to this historical background Gyeongju has many places-to-go for travelers from other regions and countries. Any Koreans would agree that Gyeongju is one of popular travel destinations in Korea. 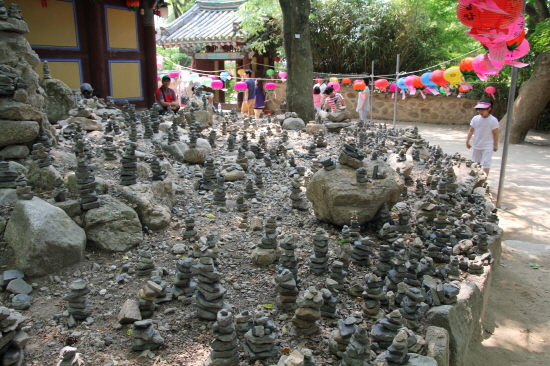 Many Koreans visit Gyeongju for school trips or family trips. My Dutch friend wanted to visit Gyeongju for this good reason. She was very curious why this old city is popular among domestic and international travelers. Do you get interested also? The trip summary will help you to the answer to this question. 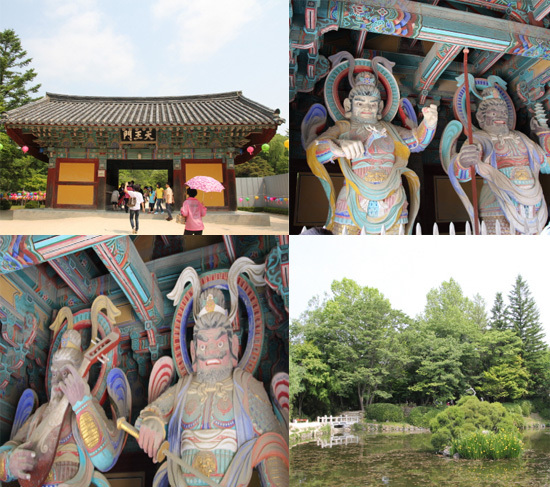 Normally you need to travel Gyeongju for at least 3 days if you look around this city. If you are lack of time, don’t worry. One day trip is possible because of KTX. Here’s the time table of one day trip to Gyeongju. Save this for your next trip to Gyeongju! You should be early bird to take this one day trip! When we arrive in Singyeongju station, I was quite surprised that it’s only 8:40. I can tell you that you will feel same thing also. 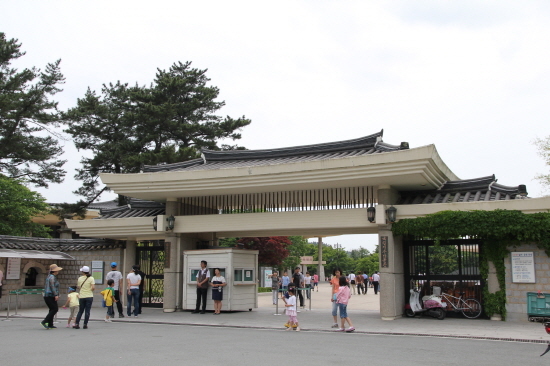 In this staion, there’s information booth where you can get maps and brochures of Gyeongju city. And you may ask bus time to the person in information desk. Don’t forget to stop by there and get any information which you need before you leave the station. 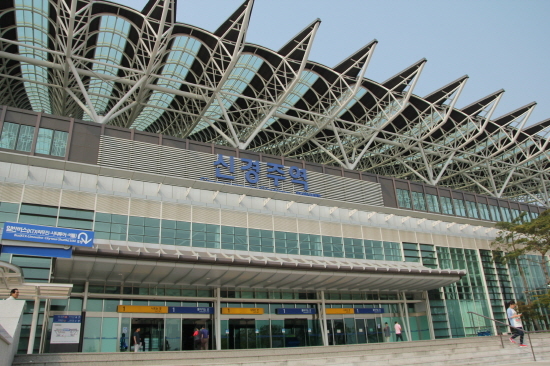 You will be easily to find bus stop and taxi stand on your right when you come out of the station. 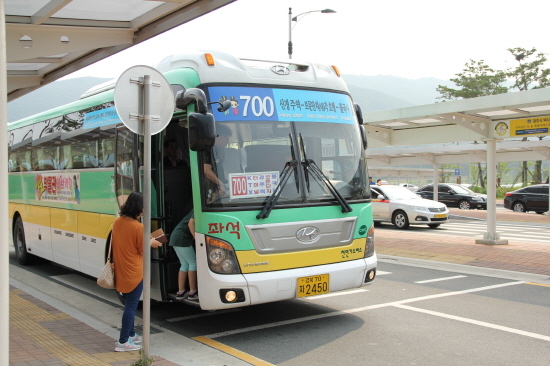 You can pay bus fee by your T-money card or credit card in Gyeongju also. This 700 bus is very popular among travelers. 700 bus stops not only the center of city but also popular travel destinations. I took this bus to visit Bulguksa Temple which is our first destination. When you get off the bus, you will find yourself in big parking lot. 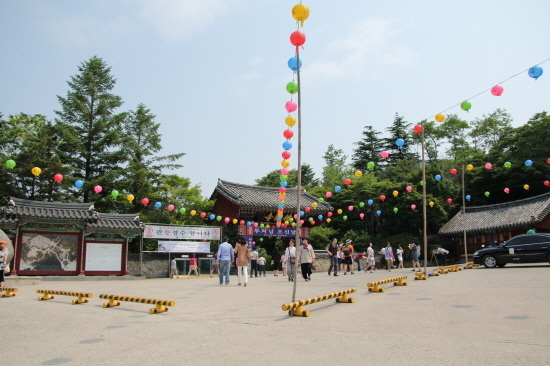 The entrance of Bulguksa temple in on your left. Walk across the road and follow other people. You may find this road where many vendors sell souveniors and snacks. If you get hungry already, try some snacks For fruit lovers, I recommend wild berries. They are very sweet and little bit sour. If you walk along the road for about 10 ~15 minutes, you will be able to the main gate of the temple. Can you guess what are hanging on the sky? They are lanterns! It was Buddha’s birthday when I went to temple. In Korea, we celebrate not only Buddha’s birthday but also Christmas. Before Buddha’s birthday, people write down their wishes on the paper and hang that paper at the bottom of lantern. They believe that their wishes will come true by doing this. At night, every lanterns light up and they are very beautiful. 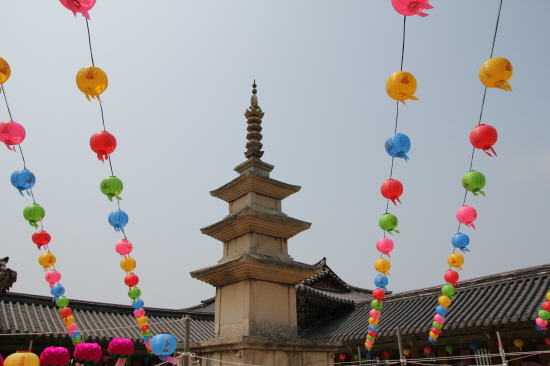 Visit any temples when the Buddha’s birthday comes in Korea and you will see colorful lanterns. If you walk for 3~5 minutes, you will find another gate. This gate is called Cheonwangmun(Deva King Gate). There are four Kings inside of this gate. It is believed that these four kings kick ghosts and evil things out and they keep the temple. That’s why people bow to them . Stay inside of this gate for few minutes, you will see people bow to them when they enter this gate. If you walk for a while, you will finally see this building in front of you. This Baegungyo bridge is very famous for its architectural beauty. The Bulguksa Temple is famous for its bridges and buildings which constructed scientifically in 8th century. It is internationally recognized masterpiece of Buddhist arts. 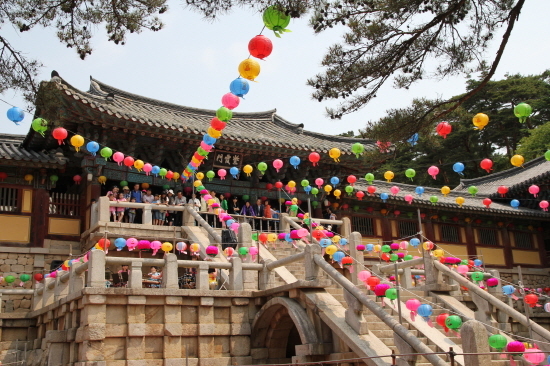 In 1995, the temple and Seokguram Grotto were inscribed on UNESCO World Heritage List. This temple keeps the national asserts including Buddhist monuments and images, and the unique Buddhist temple buildings. This is Seokgatap Pagoda which is famous for its beauty and place where very important documentary heritage was discovered. In 1966, one paper art was discovered inside of this pagoda. That was mugujeonggwangdaedarani script which the oldest printed paper in the world. Accoring to research result of this paper, it was printed before 751. Bulguksa temple was constructed in 751. It means that Silla people put the paper before 751 to keep this pagoda and temple from evil. At that time, people believed that Buddhist script has power to prevent disasters and diseases. That’s why they print Buddhist script on this paper and kept that inside of the pagoda. When you look around the temple, you will find small and unarranged pagodas. Can you guess why people made them? People put stones like this while they wishes the best luck and happiness. It is believed that your wishes will come true if this pagoda doesn’t collapse. Why not put a stone on any pagoda and make a wish for yourself and your beloved people? For lunch, my Dutch friend wanted to have Samgyetang, chicken soup. She likes to have this dish when she is tired or needs strength to her body. 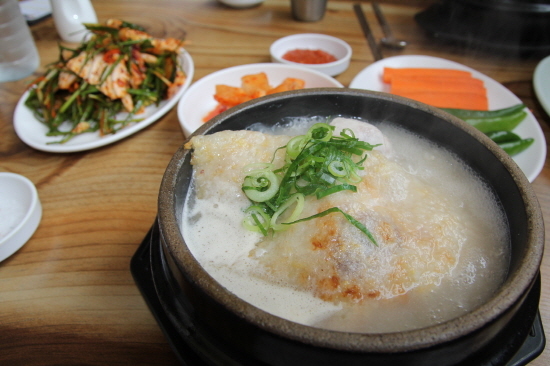 Although it’s not regional specialty of Gyeongju, try this dish if you are bit tired from your trip. After we enjoyed our lunch, we went to the Gyeongju National Museum where you can find beautiful relics from tombs and historical places in Gyeongju. When you look around the museum, you will be able to understand more about relics, Buddhim in Korea and Silla Kingdom. 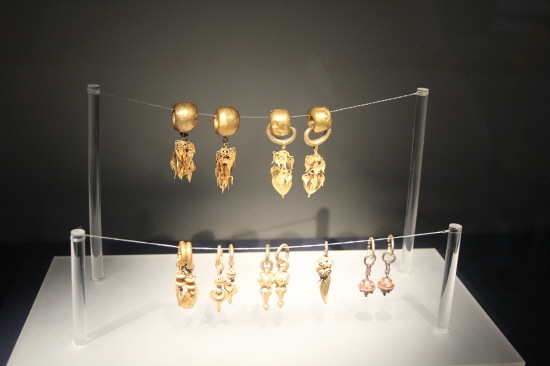 The museum is famous for big bell and golden crowns of queens and kings of Silla. Don’t forget to look at them. This museum has Saturday Museum Tour for English speakers in every Saturdays. If you visit there in other days, borrow Audio Guide. Audio Guide is available in English, Chinese and Japanese. For more information about museum, visit their website at http://gyeongju.museum.go.kr. Bring Korea to the US Classroom! Copyright @ 1999-2012 VANK. All rights reserved.